As he began to climb onto our bed, he started recalling a dream wherein he was being chased in Roblox, which is some new video game he and his brother have been playing. He sat on the end of our already cramped, queen-size bed telling us about snakes (like Indiana Jones, he hates snakes) and death. He was visibly unsettled. Often he will just tell us about his nightmares, and then head back to his room. Sometimes, though, he needs real comfort. I could tell this was one of those times. Finished with his story, he finally crawled toward the top of the bed, pulled back the covers between me and hubby, and began to insinuate himself between us. “So…sorry about this, guys,” he told us as he nestled in and began to settle down to get some more sleep. When Luke was small, we experienced periods during which the only way he would fall asleep was in our bed. He slept in a bassinet in our room until he was four months old. He slept with us again off and on from 9 months to roughly 14 months. Sometimes he would fall asleep in our bed and we would transfer him. Sometimes we were so tired he ended up staying with us all night. When we would tell other people about Luke’s sleeping habits, most would cluck their tongues and tell us what a mistake we were making. We brushed it off. In the house I grew up in, we were not allowed to sleep in my parents’ room. Ever. It simply was not done. My parents gave us our own rooms, and they expected us to be in them. End of story. When we had our children, I assumed that our kids would have the same experience that I did. But, our kids are not like my sisters and me. Our kids have vivid imaginations and stressful dreams. Joe sleepwalks. Luke, if aroused from sleep by an unexpected noise, is often unable to calm down enough to go back to sleep. We do what we can to get sleep when we can, and sometimes that only occurs when we let the boys sleep in our room. It is what it is. We have made our peace with it. I flipped around as Luke was in our bed the other night, unable to go back to sleep. I could not get comfortable because what was once 20 pounds is now 55 pounds and takes up a lot more room. I was about to resign myself to taking Luke’s place in his bed while letting him rest peacefully with his dad when, out of nowhere, the announcement came. “I think I’ll go back to my own bed now,” he said, grabbing his stuffed animal and climbing carefully over his father and out of the bed. I walked with him down the hall and tucked him back into his bunk bed underneath his sleeping brother to make sure he was truly ready to settle down. He pulled his stuffed Husky dog, Shasta, towards him, curled into a little ball on his side, and closed his eyes. He was calm, and I knew I would not be seeing him again until the morning. I’ve thought a lot about the way we “spoil” our kids by letting them do things like sleep in our room on occasion. Truth is that I don’t feel the slightest bit of remorse about it. I don’t think it’s undermined their confidence or made them any less capable of handling their fears. Instead, I think it’s allowed them to believe that when things get scary, they can turn to us. When they feel confident and relaxed, they always move forward without us. Sure. We’ve definitely lost some sleep with restless boys in our bed or on an air mattress in our room, but I think the trade off of knowing that they know they can count on us is worth it. Besides, these days are numbered. Someday they will be out of the house, and I will miss hearing that door burst open in the middle of the night and knowing that they need me. I’ll catch up on my sleep then. I can remember having scary nightmares when I was a child and how comforting it was to snuggle up against my mother and father in their bed. They always welcomed me with open arms and lots of hugs and kisses. I let my sons come to our bed many, many times when they needed that extra comfort, love, and assurance. I’m with you 100% on this. I am glad it worked out so that we didn’t miss out on this with our kids. It’s one of the sweetest things in life. Oh and adorable picture by the way! I remember fighting my mother to sleep in my own bed. So, I certainly understand a routine such as your family’s. My seven year old still sleeps with me. LOL. His sister never did. well, at his age he doesn’t helicopter around anymore. But if this doesn’t stop in a few years it’ll get awkward. Congrats on being featured on freshly pressed! Like so many other parents out there, I can totally relate and totally agree. Above all else I want my kid to be self assured and well adjusted. We just do the best we can. My daughters are all grown up now. One is in college and the other has graduated. I miss these days of no sleep, so so much! Obviously you are not “spoiling” them. The very fact that he makes the decision to go back to his room means (at least to me) that he’s secure and well-adjusted. Like you said, they know they can turn to you guys, and that’s good. Kids need to feel secure and you are building trust that will likely be good for your relationships with the boys when they get older. Kudos to you! Lovely writing, nice story. And congrats on being FP’ed. Again, it is most probably cultural differences, but the need to explain/justify it does not happen that often + the almost melancholy foreshadowing or your boys leaving home (days are counted) as soon as they turn 18 to never go back, just gave me a chill down the back of my head. Like, too much programming, too few hugs and kisses after a certain (early) age. Simply let yourself love them to bits and make sure they KNOW and HEAR it. I dislike mothers not hugging their grown-up children, and feel actually annoyed whenever I see fathers only shake hands with their grown sons; simply ridiculous, like some sort of greeting at a funeral, not father-and-son. Luke will be OK, Joe will be OK, Shasta will do just fine. Make sure you and your husband get up more in the middle of the night to go and have a loving look at your kids sleeping preacefully. You see, my dad is doing poorly, back in my home country, and that may have made me a little softer in the head than usual. Hope you are hanging in there. Sending positive thoughts to you for your dad. Thank you for your sweet comment. That photo is one of my favorites. I took it one summer day when I suddenly realized the house was too quiet. Then, there I spied my three men cuddled up together and crashed out. It was perfect. Love the photo! We are just starting out on the parenting journey; our four month old is in a bassinet next to us every night and we have certainly had people “cluck their tongues” at us as well. It is so comforting to hear that your son knows that he can come for comfort, but also has the confidence to venture back out into the scary night. =) And, congrats on FP! Congrats on your newly minted parenting journey! Have faith in your instincts and learn to block out the folks who only want to share their negative opinions. Everyone has their own path to walk and just because you’re doing it differently than someone else does not in any way imply that you’re doing it “wrong,” no matter what the naysayers say. Thanks for the kind comment. Best wishes! Thanks! I am certainly learning to trust those motherly instincts! =) Best wishes to you, too! Thanks for the reminder. Sometimes when I am writing and editing late at night, I misplace my grammar. You absolutely nailed it! When they need us, we are there, and when they need us to step back, we beam with pride and let them go forth to thier own beds. The give and take of parenting. You’re so right about the give and take. The best thing a new parent can do is recognize early that cycle and embrace it. Thanks for your nice comment. I agree with you about letting your kids into your bed. I have always had an open door policy with them, and have never had a problem with it. The older two no longer come in unless they’re sick, and then it’s usually just to let me know. Our youngest prefers her own bed. Which isn’t to say she won’t ask me to stay there with her! It sounds like you had a fairly strict upbringing. I did too. I suppose that’s why sometimes I feel as if I am “overindulgent” with my kids. Thanks for your comment. My 13 year old still sleeps with me when he’s home from boarding school. It comforts him and he sleeps better. I’ve come to accept that he will probably be asking me to move over for a longer than I expected. It’s great that he still feels that comfortable and safe with you at 13. I’m going to miss it when my oldest gets to the point when he no longer wants me to tuck him in at 3 a.m. when he’s gotten out of bed. I used to wander into my parents’ room for the same reason when I was a child. I don’t think it’s done me much harm. I hope you found the sleep you need, but I’m sure Luke was grateful you let him stay with you! Thanks for your nice comment. I appreciate it! yes, somewhat sadly, YOU WILL CATCH UP ON YOUR SLEEP THEN. (taykit frum mee, we sleep in lots now). except … sometimes we babysit the (so far only) grandson, and i’ll betcha concur: (so far) we don’t mind the sleeplessnss. ‘cuz, o’ coarse, it’s finite. If you can find a balance between love and attention, and independence, your smashing it. Luke obviously feels that he is able to come to you when he needs you, but confident to return to being by himself, at the end of it. You’re amazing 🙂 Thanks for sharing. So true that these days are numbered! As a mother of four, I have to constantly remind myself that as well. My children sleep in their own beds most of the time, but somehow, I still constantly find myself up all night due to a restless child. Thanks for this wonderful post! So true about it going fast. My son is married now and I cherish all of those nights that I was awakened because of a little one. I love your post. I can relate with the annoying “clucking” from friends and family. But each family dynamic is different and I totally agree with your sentiment. Great post and great blog! I’m glad I stumbled upon it! Thanks for your sweet comment. It is too bad that people are so quick to judge (myself included) when we have no idea what it’s like in someone else’s shoes or home. Thanks so much for sharing your story with me. Funny how we think of 14 as “too old” to need parents. I am guilty of reminding our oldest that it’s time he start tucking himself back into bed, but the truth is that some of my scariest dreams and biggest fears came when I was facing my teenage years. So many changes, so few answers. Your blog post was wonderful. Nothing wrong with leaving the lights on. What a lovely story, Luke sounds very cute. If it is any help… I slept in my moms bed with her when I was scared all the way up until I was 13. While the cases grew less frequent, it was always peace to my mind to know my mom was only a door away. I am 23 and if I wasn’t married I’d probably still crawl in bed with her when I had nightmares or just wanted to be close to my mommy. She’s my best friend. I hope my sons grow up to appreciate and care for me the way you do for your mom. Thanks for your comment. It took me a little while to truly appreciate my mom. There was definitely the teenage I hate you phase. But I love her so much now, maybe appreciate her even more because of going through that phase. I was sad when Luke was little and had been sleeping with us but then decided again he wanted to room with his older brother. It felt empty for a while. I’d be lying if I said my heart isn’t warmed every time one of them comes to us, no matter how tired I am at the moment. It is so temporary. Good for you for knowing enough to enjoy it and recognize it for what it is! What loving mother! Love your parenting story, lesson learned! Looked at your blog. You seem like an amazing mother. I admire your attitude and your strength on your journey. Look forward to following your adventures! You are giving your boys a great gift. I feel that same way about cosleeping with my daughter. At some point she will want her own bed and I am enjoying comforting her. It is also a comfort to me it has turned out. Rock on sista! I love how aware your son is about what is going on and his self soothing is turned on by knowing when he is okay again to go back to his bed. It takes confidence to know what your needs are and state them and then move on to the next. Luke has been very independent since birth, but he’s also incredibly affectionate. When he has bad dreams, I think he struggles between being strong and wanting to feel loved. Luckily for us, he usually chooses hugs. I wouldn’t trade his midnight raids on our room for anything. I told her the truth, that it’s a simple thing and it DID work for me, and I hope she could try. Since then, she whispers this about 5 times to herself before going to sleep. It has worked for her, as it did for me. My husband and I will always allow our kiddo into our bed when she needs us. Her sense of security for a lifetime is worth it. I enjoyed reading your story. I, too, do not miss sleep anymore and will be catching up, the same as you, in a time when those little hands are big ones, and their hearts don’t only belong to us. I used to love the reassurance of knowing I could sprint past the monsters down the hallway to mum and dads bed when I was little. My 14 month old son has shared my bed since he was born, which makes for a bit less sleep on my part, but I’m really going to miss him snuggling up to me when he moves into his own bed! I always slept in my mothers bed when I had nightmares that were mostly about spiders, because you see, in my room the spiders could get me but in my mother’s room the spiders weren’t allowed in. Makes perfect sense! Haha. I think the fact that your boy chose to go back to his own bed is the perfect way to let those tongue cluckers know that it hasn’t been harmful – he sounds like an intelligent, mature boy from the way he explains his dream, talks to you guys, and once he felt better, realising he could face his own bed again. Awww how sweet is that!Loved going through your post! I love this. And, you are exactly right one day they will be too big to come sleep with you when they get scared, but they will never forget that they can come to you. Enjoy them while they are young. These are golden moments. I hope you are capturing these moments on film. Our daughter slept like a log. In the car, she could be chattering or singing and in mid-sentence, even mid-word, and fall asleep in an instant filling the car with silence. But those best remembered moments ended halfway through ninth grade after she joined and fell in love with pole vault. She also joined several academic clubs taking her away from home at seven in the morning not to return until about eight at night and she was even gone most weekends to attend pole vault practice and/or competitions both academic and sports. My wife said, “I didn’t think we would lose her this soon.” Today she is in her third year at Stanford and we get a short e-mail now and then letting us know she’s still alive. Yeah, about that catching up on your sleep business…when exactly does that start? Somewhere between driving out in the middle of the night ’cause daughter’s boyfriend didn’t have a jack to change a flat (which he found just before I got there…”Tee hee. Sorry Dad!”) and the first grandson being born – – – I think I missed the window of opportunity. People have been giving me guff that I sleep with my son (13 months) in his bed (mattress on the floor) and that it’s going to cause a bad habit. While there are some nights I’d prefer to sleep the whole night in my OWN bed, knowing that my son is comforted and can sleep is more important. And then, there’s nights like last night, where he didn’t need me in bed until very early in the morning (4:30 am) and I felt like it was SO worth it because he had a great sleep by himself and was comforted knowing that I was there when he needed me. Keep up the good work! I remember joining Mom and Dad on occasion when as a kid something scared me from sleep… always welcomed too! A hug and snuggle us great against a scary dream! (Though I always woke the next morning in my own bed! No recollection of the trip back!!) Great post! It is so hard to remember that one day our kids won’t need us anymore. I take my time as a sahm for granted so often… but your post reminded me that sometimes I have to let my kids win the battle. I’m so not having kids until they invent some kind of safe, reliable children’s sleep aid. I so used to feel the same way as you. But, then, after having kids I discovered that sometimes sleep keeps me from experiencing some really amazing things. There are days, though…. I can definitely empathise with you here. Sleep deprived due to co-sleeping with my 6 year old and nearly 2 year old 90% of the time, but wouldn’t have it any other way! Love your writing style. This was wonderful and brings back so many memories of small figures standing at the edge of my bed for assorted strange reasons. From one mom to another – THANK YOU for this post. Nightmare is very common in children that can make them feeling scared and in need of comfort. BTW.Your kids are adorable and Luke reminded me of my son when he was at his age. This is a Great Blog and I enjoyed reading it! This is a sweet post, I wish I had that same treatment when I was young. And yes, I do agree that actions that show them that they can count on you are important. As a matter of fact, it has a direct relationship with your relationship with your kids in the future. Just my 2 cents. I am with you 100%. Often times I let my son sleep in my room if he’s afraid (he’s 11) and every now and again he wants to snuggle me in bed before heading down to his makeshift bed on the floor. I too have gotten a lot of flack for this, but if your kids can’t count on you to make them feel safe and secure, who can they count on?? Congrats on FP! This was a nice read. Thank you for sharing. I have three boys under the age of 9 and I do not think I have slept through the night in a decade. 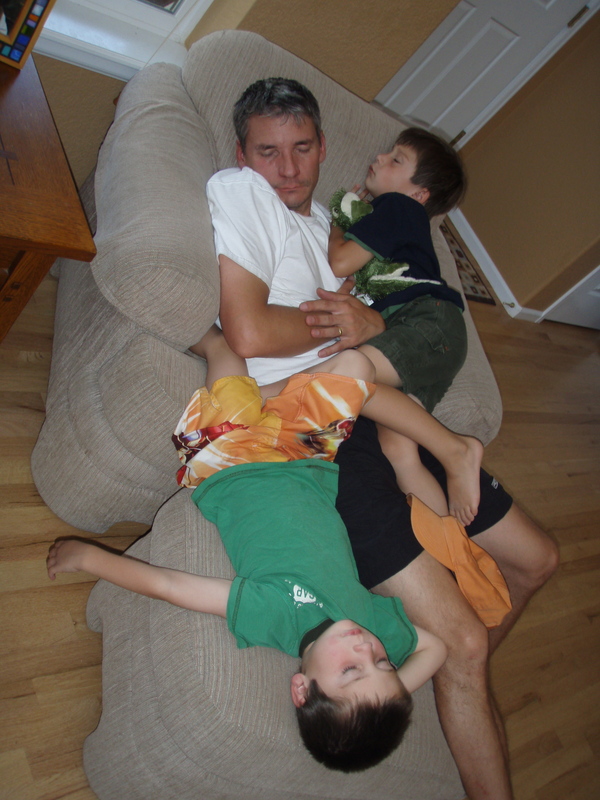 I too feel the same, Even though I am exhausted, these moments are priceless and limited…so hop right into bed boys! I question my actions often but reading this makes me realize, I am not alone in my decisions and thoughts! Thanks again for sharing! You have got your hands full. I think anything we can do to give our kids and ourselves some peace is the right thing. Thanks for your nice comment. Enjoy those fun boys! My son is 7 and I lay in bed with him every night until he falls asleep. I have for years. I used to worry about it, I used to think that I was possibly creating a monster but one day I had a client who was telling me how her son was 17 and she laid in bed with him every night for a little bit and they talked. She said it was the only time he would tell her what was really going on in his life. It was at that time that I decided I wasnt going to worry about it. I was going to spend those minutes with him and enjoy the closeness that we had and be glad for it! Like you, growing up we were not allowed in my parents room and I certainly turned out fine but it is a different world today and I never want my son or daughter to feel like they cant come to mamma when they need me! Besides, sleep is for non-breeders. That’s what I decided early on too. So not worth the battle for me. I’m so glad you are Freshly Pressed because I found your blog. My 8-year old only comes in our room about twice a year now after years of coming in maybe twice per week. I too wanted him to know we would always be there for him and never turn him away. His attachment to us is so secure, I believe, because of those types of choices on a daily basis. “Besides, these days are numbered. Someday they will be out of the house, and I will miss hearing that door burst open in the middle of the night and knowing that they need me. I’ll catch up on my sleep then.” … It all rolls by faster than you can possibly imagine it, cherish each moment while you can. This is what happens in life, when your nightmares are more interesting than what’s on TV. Congratulations on being Freshly Pressed! I have a nearly 2 year old and “sleeping through the night” has been a distant memory. My son isn’t yet out of a crib, but has never been a great sleeper. Unlike my brother and sister, I had vivid nightmares as a child, starting as a toddler when I had “night terrors.” I would curl up nearly every night on my parents’ floor with a comforter and my pillow. Of course, I grew out of it. I think a lot of sleep is a mystery — why some people are good sleepers, why some people aren’t, why some kids have terrible dreams, some don’t. And we should definitely give comfort to our kids. However, as a sleep-deprived parent, I also know that it’s important to balance that with making sure that everyone is getting enough rest to be physically and mentally healthy! I agree. You have to strike a balance or find what works. Sometimes it takes a while. But, no one is at benefit when Mom isn’t well rested! I think it is good for kids to at least have the option of climbing into their parents beds. I have twins who are almost two. Right now they sleep very well in their own rooms but for the first 6 months they shared a room with me. And then until almost a year Riley would only fall asleep in our bed cuddled up against her daddy (technically step dad but he has been there since day one). When the girls were really small and couldn’t sleep (or had just had shots) we would do kangaroo care with them. I think it is so important for parents to give their kids whatever comfort they need even if it means loosing a bit of sleep. I used to sleep in my parents room on and off till the age of 6 and then I just didn’t feel the need. And yes it was very comforting to know that I could go in their room if I needed to. Now I don’t even get to see them more than twice a year because I live in a different country. Nicely crafted article about the emotional rollercoaster that is the human condition. Very Engaging. i slept with my parents on and off until i was 13 or 14 maybe,so it makes my parents my protectors for always. I miss sleep…but then again, I get about 4-5 a night at MOST and work 3rd shift…I can’t wait till my son goes to school full time (he’s special needs 5 yr old) LOL, I will get much more sleep then. Like you, we were never, ever allowed to sleep with our parents growing up. My sister and I would usually end up in each others bed. I remember both of us feeling really scared, and because of that, I let my kids sleep with us. My parents, of course, criticize this, but I’ve held firm! We did have to get a bigger bed, though! I live in a country where kids sleeping in the bed (or futon as it is) is the norm. I said good night to a good night’s sleep along time ago!! Your last sentence sums up the sentiment here in Japan. I’ve learnt to love this custom and snuggle up to my kids almost every night. Nice read, thanks for posting. I agree, they’re only small once! My daughter is 16 months and hasn’t taken to sleeping with us yet, but there are many other things that others could cluck their tongues at me about. I try to remember that I’m doing what I feel is right and that it will all turn out in the end. I think that’s the hardest thing to do as a parent…ignore negative comments from others, trust your instincts, and know that as long as you love your kids and show up for them things will be fine. Thanks for your comment! A lot of this sounds very familiar, and you write about it so beautifully. When our 5 year old wakes up from a nightmare, after he tells us about it, we (pretend) to scoop it up, and then flush it down the loo so he doesn’t have to worry about it coming back when he falls back to sleep. It always makes him feel better. I was so glad to read your blog. I have a 12 year old daughter and a 7 year old son. I have no problem allowing them to sleep in our bed whenever they need comfort. They eventually move to their own bed when they are ready. Our 12 year old rarely comes into our room anymore. Our 7 year comes in less than he used to. I believe in making sure our kids know they can feel secure and trust that we will always be available for them. Cute.. i love reading this..
thats so true! great blog! feel free to take a look at mine! I’m slowly catching up on blog reading and commenting. Look at you all Freshly Pressed! Congrats. I so agree that the way our parents raised us has changed so much now that we have our own kids. It’s a different world, but more so that we have different kids. Being flexible and adaptable is much more the norm now. I think those people clucking and tsking that you let your boys sleep with you may have also come to similar conclusions in similar circumstances. So bittersweet that your son and Shasta went back to their own bed. He knows he is growing up and needing less and it’s just a little way to show you how to let go. You’re right, and I can attest first hand that ‘these days are numbered’. Before you know it, you’ll be sleeping all you want, where and when you want. Keep being supportive. That’s your job. As the mother to two grown boys, I can attest to missing sleep, yet, I would’t have changed it for the world. Kids grow up quickly and you end up missing the days where you just had a small someone to cuddle with. I feel that way already and I still have one who is sort of smallish. Thanks for your kind comment. Great post. First time I read this issue discussed from this angle. I think I like this view better. Wouldn’t encourage over-indulgence though. Thumbs up! This is a beautiful post. I was the ‘trouble sleeper’ in our family and had bouts of night terrors and insomnia from when I was about 3 – I rarely climbed in to bed with my parents, but when I did I remember feeling the safest I’ve ever felt. And when I was ready to take on the sleep fears by myself, I remember tapping in to that safe feeling knowing it existed in my life and I could access it at any time, even at a very early age. I think you and your husband are doing it just perfectly. This is a great post, we were just saying the other day how different our parenting styles are compared to when we were kids. Having twins it seemed like a revolving door in our room, but after awhile it kind of all works itself out. Now occasionally the twins will come in just to check to make sure we are where we said we’d be, then they run off to bed. Your right, the days are numbered for when they are little – and when they are teenagers we will be “so uncool” so it’s great to enjoy them and create a connection with your child. Thanks for sharing such a heartfelt post, truly enjoyed! It’s so funny what kids will say, Kristi. When my sons were very young (3 and 1), I used to sing to them before bed. One night, the oldest told me, “Mommy…you don’t have to sing to us.” Translation: “You’re hurting our ears.” Now I only sing in the car when I’m alone. Have a great weekend! Thank you for following your instincts. There’s too much weird advice out there from people who don’t have children (or don’t have happy ones), and all it does is traumatize kids. They grow up fast. You’ll sleep later. Nice story! indeed.i must say in India, its different. We sleep together in one room.though we have separate room for each of us.We never allow Kids to sleep in separate room ever. Your story reminded me of my childhood and of those nights i cuddled my mother.Thnx for bringing back those memories. Americans are very fussy about having space. Unfortunately I think that causes more problems than good. Thanks for your perspective! Very sweet, and so true, My daughter is only over a year but I miss her waking me at night and the feeling when I would awake the next morning in the glider, sleeping all night with her in my arms. Now she goes 12 hours without me but I wouldn’t mind another sleepless night or two if I could have that again. My 5 year old has has night terrors since he was about 8 months old. He’s now advanced to night terrors and sleep walking. My two year old also suffers from night terrors – so I definitely know how to survive on little sleep! I agree with you – how are my kids supposed to turn to me with their fears and worries during the day, if they can’t do so when they’re most vulnerable, at night? My baby was always welcome in my bed growing up. She’s a teenager now and there’s nothing different or more screwed up with her than others. I think it’s special when a child comes into bed with you and cuddles even for just a little while. Occasionally my teenager will slip into bed with me and I’m so grateful for those few special moments with her. We have 2 toddlers that make our king sized bed feel something like a cot. We’ve tried putting them to sleep in their own beds (yes they have them) or transferring them or having them lay down with their big sisters but somehow they always end up back in our bed. It’s been slightly frustrating at times but I find that it takes more energy and I get far less sleep going back and forth all night than if we all just go to sleep in one bed. Like you, I’ve had lots of “clucking” adults who think they’ve done it better but as a mother of 5 girls, a full-time nurse, a continuing college student, and a wife I find that my best sleep is had when everyone is comfortable. It sounds to me like Luke has 2 great parents and that later in life he will be far more confident in himself and trusting in you both to guide him (or comfort him when he has a nightmare)! though its my first visit, I found this article quite interesting. In my view, let the kids sleep with the parents as long they feel comfortable, may be at some point of time they may like to sleep in a separate room without interrupting parents. So sweet! And so special! Awesome!! Good for you! They’re only little once…and you can never get the time back. Our daughter (3rd born) slept through the night consistently before our son (2nd born). I would wake up to find Jason looking me in the face as he stood by the bed in the middle of the night. He would climb in bed to cuddle for a while or I would walk him back to bed, depending on the situation of the night. I certainly didn’t mind. He was such a cuddler. Our daughter was plagued by nightmares, and so I would read book after book to her until she was comfortable enough to go to bed. After our son died, there were so many other things I thought of that I wish I would have done differently. I’m not saying that I did it all wrong, but there were things that seemed important at the time that I now realize really weren’t. To a child, the soft pillows, the warmth of the sheets, the company of stuffed toys cannot replace the secure embrace, the lingering scent and the soothing voice of their parents. You’re doing just fine by spoiling your children in this way. I too get less sleep than ever before, and it is worth every bleary eyed, darkened circle under the eyes, listless yawning moment. I can remember jerking awake on the sofa after dozing off while my daughter was playing on her blankie and how guilty I felt. Bad Daddy, Bad!!! My kids slept with me and her until they no longer wanted to. Seems natural to me.